It is no more than three or four miles as the crow flies across the hill tops between Ffynnon Oledd and Ffynnon Enddwyn, two wells very similar in location and in style and both with a reputation for being beneficial to sufferers of rheumatism and arthritis. They are connected by footpaths across the hilltops, although the day I visited both I chose to drive to from Barmouth to Dyffryn Ardudwy; and whereas reaching Ffynnon Oledd had required an hour’s hike up the hillside, I was then able to drive up the hillside and park within yards of Ffynnon Enddwyn. Baring Gould and Fisher state, without giving a source, that hundreds of pins were from time to time taken out of the spring. 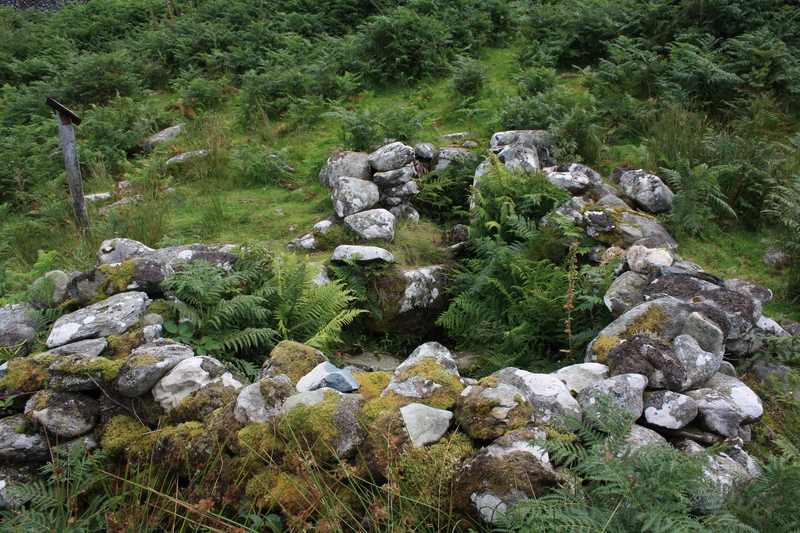 Thus similarities also exist between the histories of this spring and another nearby well, Ffynnon Fair at Llanfair. 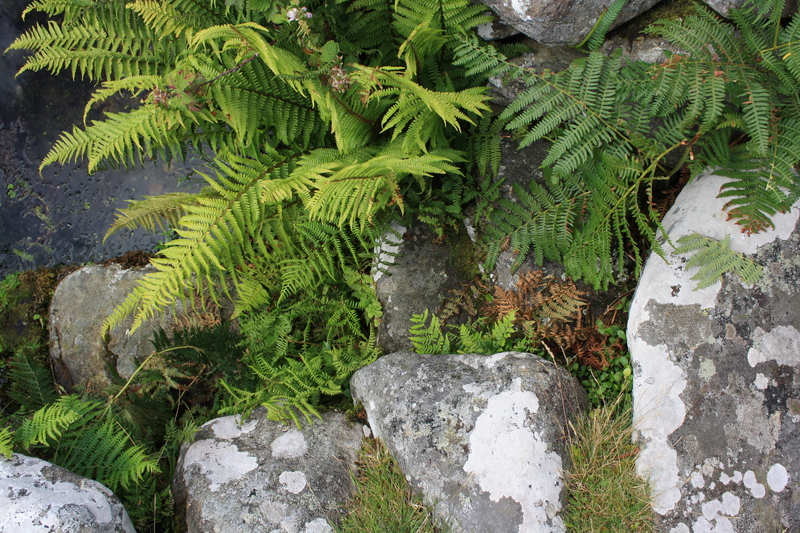 In both instances the well is said to have been discovered by the particular saint finding a sudden need for a spring while walking across the hills away from the community to which the well belongs. This may hint at the regularity with which people from this narrow coastal plateau had to trek up into the hills behind which form a chain running up the coast and which are still crisis-crossed with tracks, remnants of communities and home to scattered small settlements. 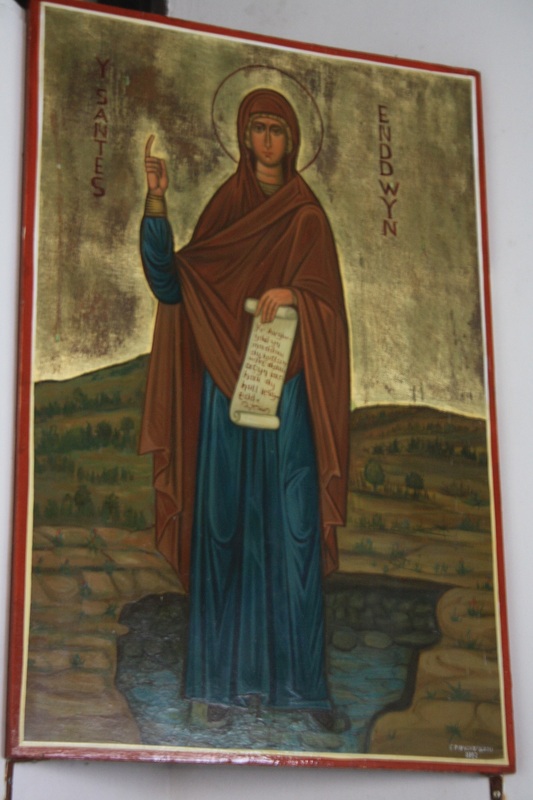 It is a local tradition to identify Enddwyn as a female saint and a modern wall hanging in her church at Llanenddwyn shows her standing beside the well. However Baring Gould and Fisher conclude that there is no clear evidence of who Enddwyn was, even with regard to gender. Enddwyn, the patron of Llanenddwyn, Merionethshire, would appear to be the saint intended by Endwy ab Hywel Farchog ab Hywel Faig ab Emyr Llydaw, mentioned in one entry in the lolo MSS Sometimes the saint is said to have been a female. Browne Willis (1721) suggests that the dedication of the church was to an unknown St Damian. In mountains about 2 miles from church. Bathing chamber added probably in 18th century. Spring rises in sunken masonry lined chamber ca 3 ft square, flowing into larger enclosure with steps down. Whole surrounded by low wall. 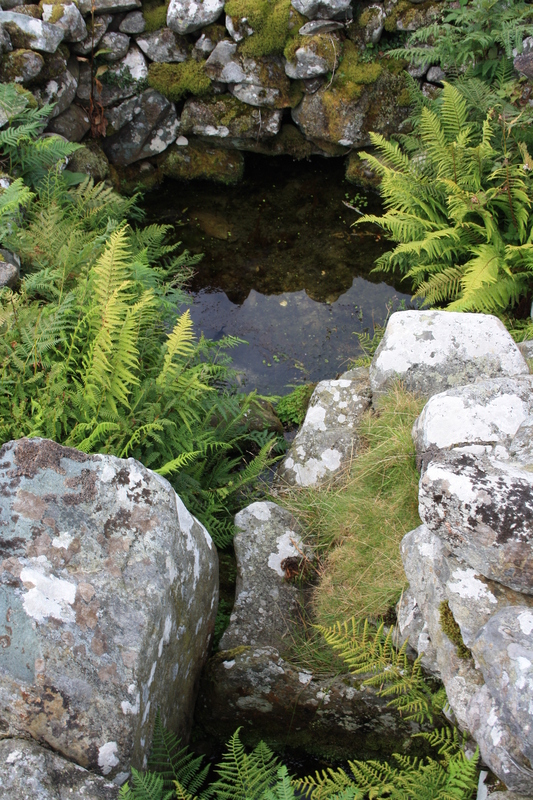 The waters of a spring called St. Enddwyn’s Well are thought to be efficacious in the cure of rheumatic affections. The well as seen today broadly matches this description. The main stone lined pool is accessed by steps down on the northern side. It is kept filled from a spring which rises some three or four feet away and flows freely through a channel of scattered large stones which one assumes would probably once have formed a better defined channel. Water flows out from the main pool onto the hillside. The spring now seems to attract a regular stream of visitors, the coastal strip is a popular holiday destination and the well features in the tourist information. Its primary attraction must be the views, from its hillside location you can look across the bay, and down the Llyn peninsula towards Abersoch and to Bardsey Island. *** Nov 2017 – sad to note that St Enddwyn’s church is now closed to the public and has been put up for sale. Browne Willis (1721) Survey of Bangor, cited in Baring-Gould and Fisher. Fascinating, thank you. Oral tradition usually is accurate I believe and being a female saint would go with the probable ancient associations of many springs and lakes with female divinities in pre-Christian times. With Bardsley Island so near it was probably a heavily-used well always. Thank you for your careful documentation and images! Jen – thank you for commenting. 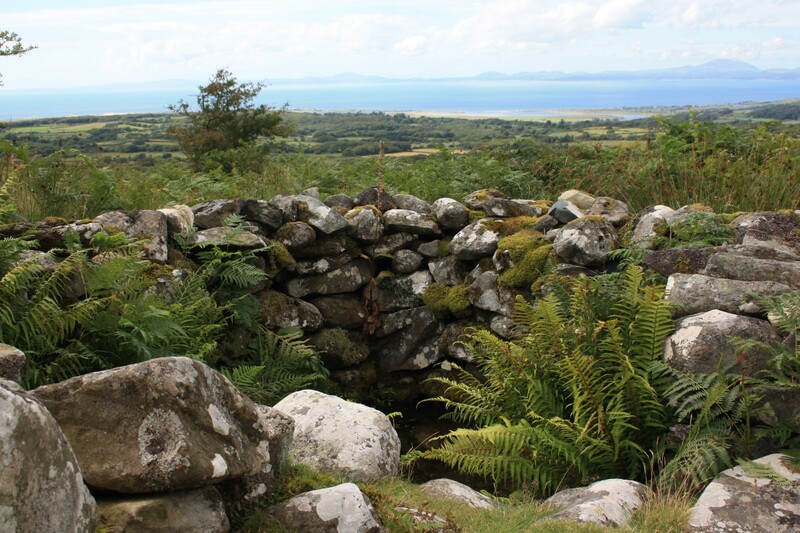 I tend to agree that the well would have long been used in association with pilgrimage to Bardsey. There is no reason to doubt that the saint associated with the well should be female and that local tradition would support this; It is the case though that the dedication of wells has been known change over time and the origins of its dedication to Enddwyn and who she was have clearly been lost. Many thanks for this post! I hope to visit this well with my family this summer in August. We’ll be staying near Barmouth. I’m really sorry to hear that – i see you put up a fight to save it, so it is very sad that another old church is being lost and a lovely old building closed down. It is increasingly common unfortunately and I can imagine many more will inevitably go the same way over the next few years.So much history being lost so quickly. Groups like Friends of Friendless Churches have managed to save several in the area, but it is so difficult to keep up., there just isn’t the money to go around. It seems to be a standard set of clauses that the Church of Wales impose on church sales, that the saint’s name can no longer be attached to the building, I have seen this before. Given that this is the only church dedicated to Enddwyn it is a name that will vanish even further into the mists of history, only the well will now carry her name. thank you for passing on the information.